Product prices and availability are accurate as of 2019-04-15 04:21:05 UTC and are subject to change. Any price and availability information displayed on http://www.amazon.com/ at the time of purchase will apply to the purchase of this product. This solid fir wishing well garden fountain will make a great addition to any garden, patio or backyard. 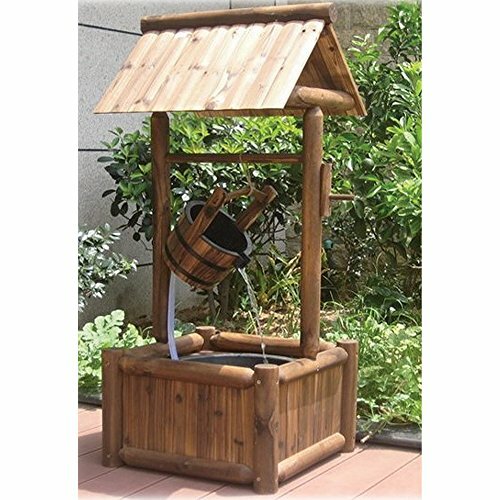 It has an attractive burnt wood finish and been of solid wood is built to withstand the weather and the supplied hardware is made from corrosion-resistant stainless steel. The bucket is plastic lined, 20.27in. in diameter and approximately 8in. 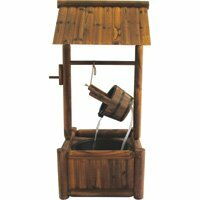 deep, it is used as the outlet for the water fountain which is pumped by the built in 120v electric water pump. The water pump when plugged in and switched on has a 300 ltr per hour rate. There is no on and off switch on the garden fountain so you must unplug it to turn it off.